Supports mp and sw game modes. Place te_frostbite.pk3 in your rtcw/main directory. If you have either te_frostbite_beta.pk3 or te_frostbite_beta2.pk3 please remove them from your main directory. This is especially important for server admins. If the beta pk3s aren't removed from the server, it will likely run the beta.pk3 instead of the final version, and players will be kicked for not having the beta pk3. mp_frostbite.pk3 and te_frostbite.pk3 should be able to coexist with no problems. December 1944: The Allies are pushing through France towards Germany. Hitler's counterattack on the Allied offensive is to bring in the "Panzer" tiger tanks. The Allies are wanting to strangle the counter offensive by cutting off the fuel supply lines to the panzer units from the Axis' hidden fuel depots. The Allies have discovered a base with the depot locations and destination routes.Your mission is to get in..steal the documents and transmit from the Axis radio located near the base.The weather is at it's worst,the cold is extreme..but you must succeed at all costs..and aviod the Frostbite! Det Pak for bringing the map to life with sound, and ideas for touching up the map. Team dot for supporting and promoting the map. 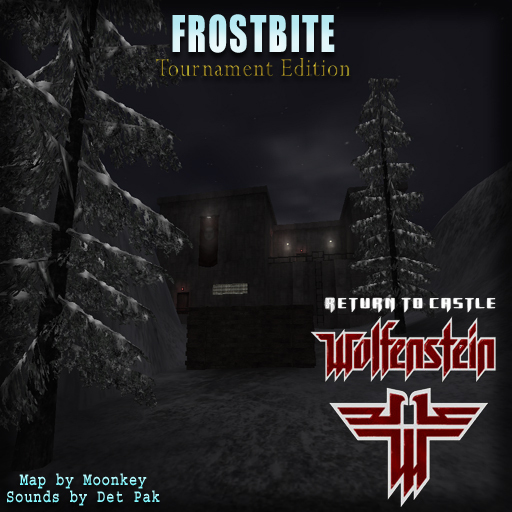 *NOTE* This map is for the game Return to Castle Wolfenstein. It will NOT work on Wolfenstein: Enemy Territory or any other game.